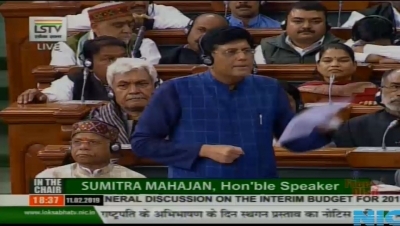 New Delhi, Feb 12 (IANS) Finance Minister Piyush Goyal on Tuesday said in the Lok Sabha that the proposal to increase the rebate for taxpayers up to Rs 5 Lakh has been welcomed across India as it gives lower tax and higher cash in the hands of small taxpayers which will also give a fillip to the economy. Moving the Finance Bill for consideration, he said: "The NDA government allowed Standard Deduction of Rs 40,000 a year which is now hiked to Rs 50,000 per annum." Dwelling on the last five years of tax proposals by his government, which he said has given enough benefits, Goyal asserted that the significant benefit coming out of the Budget proposals give good amount of savings to small tax payers which will help them in their day-to-day purchases and which in turn will boost the economy. "In the last five years, the government has done a number of major changes in the income tax concessions and deductions available to all the taxpayers and in one way or other we have addressed every section of the society," Goyal said. Highlighting the changes, the Minister told the house that interest payable on housing loans had been hiked to Rs 2 lakh from Rs 1.5 lakh while deductions under 80C for investments made in certified savings have increased from Rs 1 lakh to Rs 1.5 lakh. The NDA government had also introduced standard deduction which was not there earlier for salary earners and pensioners up to Rs 50,000. Similarly, the exempted amount on which tax was not payable at all had been hiked from Rs 2 lakh to Rs 2.5 lakh and then from Rs 2.5 lakh to Rs 3 lakh by giving additional rebate. "In this Interim Budget, we have given further tax rebate so that income up to Rs 5 lakh is exempt. We have also increased the exemptions applicable to the senior citizens on interest incomes to Rs 40,000 from Rs 10,000," he added. The Interim Budget 2019 had echoed the government's firm commitment to substantially boost investment across the agricultural, social, educational and health sectors as well as promote welfare for the economically weak, rural sections and the urban middle class. The direct tax proposals put forth in the budget have firmly portrayed the government's intent to continue extending momentum of the buoyancy in direct taxes and expanding the taxpayer base, with suitable respites.